Iron Backpacks deals with portable storage and item manipulation through tiered backpacks and a system of modular upgrades. Warning: The releases for 1.11 and 1.12 are early builds and do not yet contain all the old features. These will come back with time, believe me that I want the features as much as you - life is just very packed for me nowadays. You will most likely experience bugs, and if you do please report those to Github. Thanks! Note: Use an anvil to apply upgrades now. 4 tiers of backpacks, with specializations for higher tier backpacks (more storage versus more upgrade points). The ability to equip the backpacks and have them visually appear on your player. Over 20 different modular upgrades that allow you to customize the abilities of your backpack. These range from smart gathering to inventory restocking, from quickly depositing items to persistence through death, from visual indicators of fullness to compressing items on-the-go, and so much more. Compatibility with several mods, most notably Just Enough Items, Inventory Tweaks, Ender Storage, Better Builders Wands, Not Enough Wands, TombManyGraves, and more. It is specifically coded to be efficient and performance friendly. Highly configurable so that it can suit any playstyle. The majority of the documentation is in-game via custom JEI compatibility. Highly recommended. In 1.11 and above, upgrades are applied via an Anvil. Please report them on the issue tracker. Feedback and feature requests should also be directed there. Some more progress has occurred, spurred by the recent addition of a design document to clear up my vision for the other coder(s) assisting me. Writing down all my ambitious plans definitely excited me, so I'm stoked to return from my travels and get a release out to you all! Some progress has been made, and an alpha is available! Please be patient with fixes/improvements, as, until my return on January, TehNut will be the only developer actively working on the codebase. I apologize for the delay in updating to 1.11/1.12. I had planned to get this out way back in late July, but a busy summer combined with an unexpected family crisis forced me to temporarily abandon anything non-critical to my life (including modding). That period of time (late summer) was when I had set aside time to do the port (which is also a rewrite, complicating matters), but sadly that time disappeared. It is now late September, and I am about to embark on a globetrotting trip (8 countries over the course of 2.5 months), and, realistically, I won't mod while I'm traveling. This means that the soonest you can expect the port is late January, with mid-February being much more likely. Once again, it pains me to not have a port out sooner. I would have loved to get it to all you beautiful people, but the fates have conspired against me, and the free time I planned on using to do this port was swallowed. My trip will then delay it more. However, when I return I plan on resuming my work and getting it out ASAP. If you want to stay super up to date, your best chance is to view the GitHub commit history, on the 1.11 or 1.12 branches. Don't expect to see anything until around mid-December (at the earliest) though. In the meantime, I'd recommend Wearable Backpacks as a good alternative. 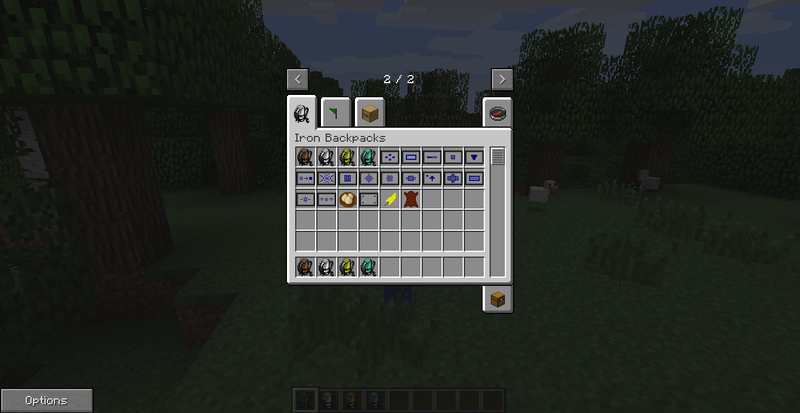 I am committed to continuing to improve this mod; when I return you can expect the best version of Iron Backpacks yet! The changelog can also be found there. Note that there is also an API for other mods/modders to utilize. Yes please, feel free to include this in any normal (i.e. EULA-compliant) modpack. If you expect the pack to be popular, all I ask is that you please just give me a heads up so I can more easily track the playerbase. Thanks! What works best for me is either through the messaging system here on CurseForge, or on the typical modded MC Discord channels (e.g. MMD, FTB, etc.). Also, check out my other mods! In the meantime check out DireWolf's video above. Note: The text entries will always be updated, the pictures/videos may not be. For the 1.10 version check out the wiki here. Alternatively, just use JEI, as there is a lot of custom compatibility to provide in-game documentation! For the 1.7.10 Version expand the spoiler below. Basic - The default backpack. Default values: 2 rows of 9 inventory slots (18 total) and 8 upgrade points. Iron - The next tier. Default values: 4 rows of 9 inventory slots (36 total) and 12 upgrade points. Gold - The next tier. Default values: 6 rows of 9 inventory slots (54 total, equivalent to a double chest) and 16 upgrade points. Diamond - The final tier. Default values: 7 rows of 11 inventory slots (77 total) and 20 upgrade points. Each backpack has two GUIs (graphical user interfaces). The default GUI, the one which stores all of your items, is accessed by right clicking. The alternate GUI is accessed by shift-right clicking, and it will display the alternate GUI upgrades (if applicable), such as the ability to rename your backpack. In addition, when a backpack is open, right clicking another backpack in the player's inventory or in the original backpack will open that backpack's GUI directly (yes this works with nested backpacks). You can also do this with ender-storage backpacks. When the backpack is upgraded to the next tier (ex: gold -> diamond) it keeps it's inventory and any upgrades it had. The same thing happens (keeps it's data) when an upgrade is applied (shapeless crafting). Finally, you can equip any 1 backpack at a time. To do so, use the keybinding for "equip backpack," ('B' by default) and, assuming you aren't already wearing a backpack, the backpack item currently selected in your hotbar will be equipped. To take it off, simply press the same key (but you must have an empty slot in your inventory). To access the equipped backpack, simply press the correct keybinding ('R' by default). Upgrades are items that are shapelessly crafted with a backpack to apply them to said backpack, assuming the backpack can accept the upgrade. Each upgrade has a (configurable) point value, and each backpack has a (configurable) number of maximum upgrade points, and, in combination with some other categories (i.e. only up to 3 alternate GUI upgrades), that determines if the backpack can accept the upgrade. To remove an upgrade, you put the backpack in the corresponding slot of the crafting grid of the upgrade that you want to remove from the backpack. So to remove the 2nd upgrade on the backpack, put it in the 2nd slot in the crafting grid. You can also simply re-craft the backpack with the upgrade you want to remove, but this will require you to make the upgrade again (which you don't get back). Adds buttons to each category in the alternate GUI which quickly clears the items in the category of the respective button. 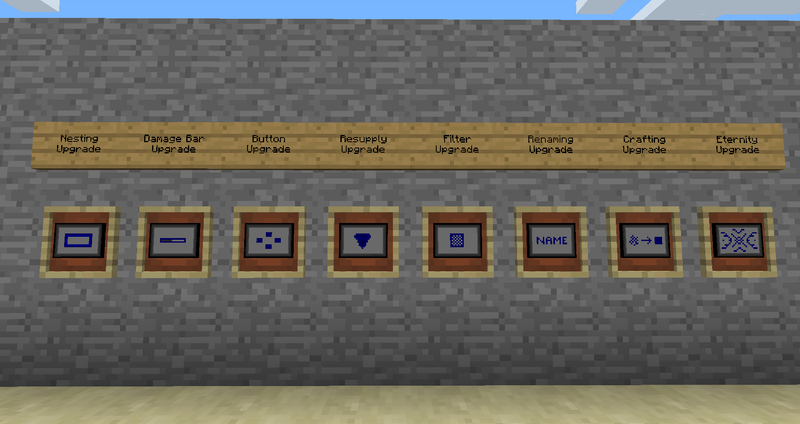 Crafting- Adds 9 slots to the alternate GUI, each of which are composed of ghost slots (that don't take your item). Whenever you pick up an item, each item in the backpack will check if it is also in a condenser slot, and if so, will try to be crafted into a condensed version by simulating it being placed 3x3 in a crafting grid. For example, if you have redstone in the crafting slot, and 64 redstone in your backpack, when you pick up an item you will now have 1 redstone and 7 blocks of redstone in your backpack. This upgrade will sort your backpack after it condenses an item. Since this upgrade fires when an item goes into it it needs a filter upgrade to work (I will try to make this unnecessary later, but for now that is the case). It also works fine with the restocking upgrades. Small - It will put the items in a 2x2 grid (ex: sand -> sandstone). Tiny - It will put the items in a 1x1 grid (so 1 item at a time, ex: log -> planks). 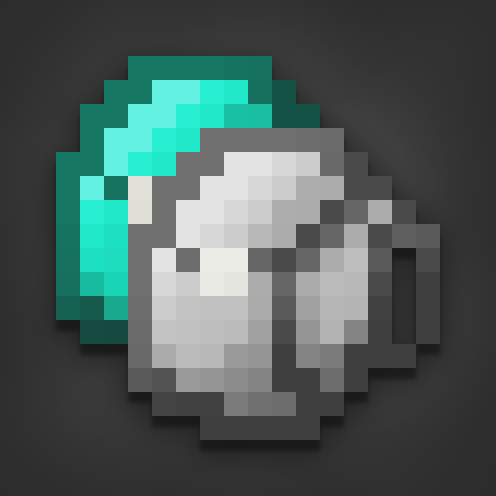 Damage Bar - This upgrades adds a damage bar to the backpack which reflects how full it is (in regards to it's total capacity), meaning that you can simply glance down at the backpack to get a quick visual representation of how much space you have left. The level of fullness is representative of the total storage, not the total slots used (so a backpack full of 1 piece of cobble in each slot would be the same fullness as about 1 stack of cobble). Basic - It will check for the exact item in the filter slot(s). Fuzzy - It will ignore damage values. 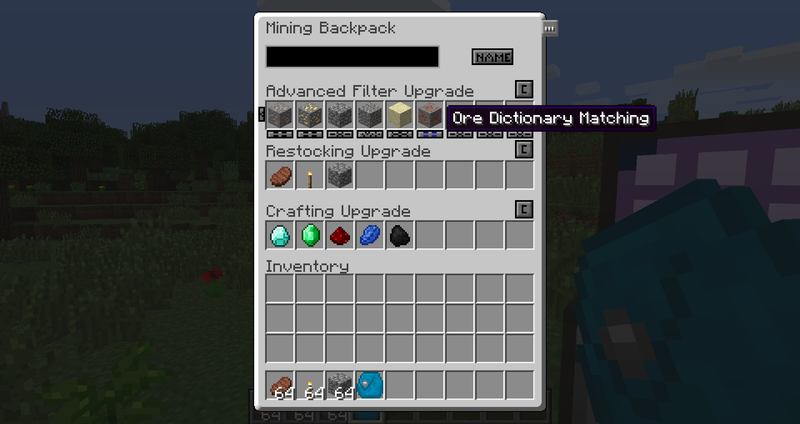 Ore Dictionary - It will not check for the exact item, but rather for any item that is registered in the ore dictionary that the item in the filter slot(s) is also registered to. Mod Specific - It will not check for the exact item, but rather for any item from the mod that the item in the filter slot(s) is from. Groups vanilla Minecraft items together as a "mod" for this purpose. Mining - This upgrade automatically picks up any ores, dusts, and gems, and has 9 open slots for other items (ex: cobble, other minerals) to be placed into. Advanced - This upgrade has 18 slots instead of 9 like the other filters. You can rotate through the slots by either clicking the arrows on either end or by scrolling your mouse wheel in any of the advanced filters' slots. Each slot can be configured to be either exact, fuzzy, ore dictionary, or mod specific matching by clicking the button below each slot. Void - This filter will void anything placed into it. So instead of picking the item up, it gets deleted. Resupply - Adds 9 slots to the alternate GUI, each of which are composed of ghost slots (that don't take your item). This upgrade applies whenever you pick up an item or whenever you use an item (i.e. eat food). If the backpack contains the item that is present in any resupply upgrade slot (in the alternate GUI), the backpack will attempt to refill a stack of that item if it is present in your inventory. For example, putting torches in a resupply slot will allow you to constantly have 1 stack of torches in your hot-bar. (Advanced) Nesting - The nesting upgrade allows you to put as many backpacks of any previous tier as you want inside this backpack. The advanced version allows you to put any backpack inside of it, including backpacks of the same or greater tiers. Note that you can right click any backpack inside any other backpack to directly open it. Depth - This upgrade allows an equipped backpack to have the upgrades applied from any backpacks inside of it to still function. For example, say you had an Iron Backpack (with a mining filter upgrade) inside of a Gold Backpack (with a nesting upgrade obviously), and you had the gold backpack equipped. Then, when you picked up an ore it would go directly into your Iron Backpack (even though it is nested inside your Gold Backpack). This only works with one nesting (i.e. you couldn't put another backpack inside the Iron Backpack and have that one pick items up). It also works with nesting backpacks that have the quick deposit upgrade. Check out the video in the spotlights section on for more information. Quick Deposit - This upgrade allows the player to shift right click on any inventory to deposit the contents of the backpack into said inventory. For example, you can come home with a backpack brimming with items after a mining trip, and instead of manually clicking the items into your (sorting) chest you can just shift right click the backpack's items into the chest. Note: Currently doesn't work directly with Applied Energistics terminals, to get around this you can deposit into an ME interface. I will try and fix this in a future update. Precise - This variant will only attempt to deposit items if they already exist in the targeted inventory. For example, if you have an ores chest and you use this upgrade, only the ores already in the chest will be deposited from the backpack for a convenient but basic sorting mechanism. Renaming - This upgrade only appears if you have the config option "renaming update required" set to "true". If you do, then this upgrade will add a bar in the alternate GUI where you can type in a new name for the backpack and then rename it (much like in an anvil). If the config option is set to false, this upgrade will be applied by default. Eternity - Allows you to keep the backpack and all of it's contents when you die. However, the upgrade will disappear after this, you will have to make and apply a new one if you want the upgrade again. Additional Upgrade Points - This upgrade adds a (configurable) amount of upgrade points to the backpack, and can be applied a (configurable) number of times. The size of each backpack. Either 9 or 11 slots per row and between 1 and 7 rows. The number of available upgrade points for each backpack. Every recipe in the mod! The number of upgrade points each upgrade takes to apply it to a backpack. If the renaming upgrade is required, or if it is included automatically. The length of time until tooltips appear on buttons when you hover over them. The amount of upgrade points the 'Additional Upgrade Points' upgrade adds to the backpack. The number of times you can apply the 'Additional Upgrade Points' upgrade to a backpack. Whether or not to render the backpack on the player when it is equipped. The current items in the mod (as of v1.2.0). 4 backpacks, 16 upgrades, and 4 crafting components. NEI - Shows most recipes. Doesn't show NBT specific crafting, so it doesn't show that shapeless crafting with an upgrade can remove an upgrade if it is already applied, or other special conditions (i.e. you can't have both a nesting upgrade and an advanced nesting upgrade on the same backpack). Version Checker Mod - Fully supported. Botania - The backpacks are an IBlockProvider, meaning they can supply items to the Rod of the Shifting Crust. Note that it currently doesn't work with equipped backpacks due to API limitations. Inventory Tweaks - Fully supported. Thaumcraft - All of the items in the mod contain aspects. Open Blocks - If a player is hang-gliding the backpack will not be rendered. Ender Storage - You can right click ender-pouches inside my backpacks to open them directly. Should work with most every other mod as well. Note that mods that add custom models for armors may overlap a little with my backpack's model. This is just visually annoying, and will not affect gameplay in any negative meaningful way. I may look into handling this better at some point in the future, but it is not a priority. Been awhile since i used this mod are all the upgrades Implented back in the 1.12.2 version? No, not yet. 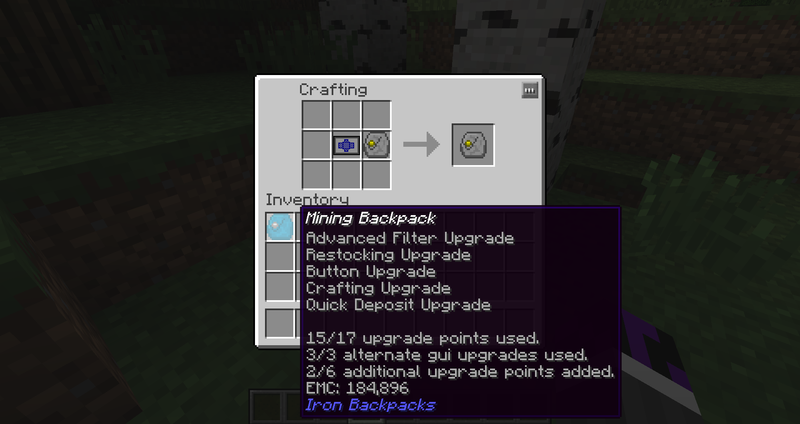 Currently, the 1.12.X versions of Iron Backpacks only have the damage bar upgrade (adds a bar over the item to show how full it is), latch upgrade (locks everyone but the owner out of the backpack), and everlasting upgrade (prevents dropped backpacks from despawning). 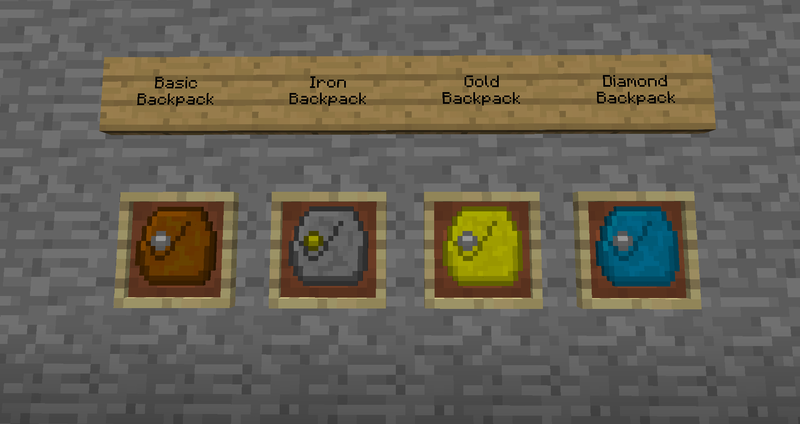 I’m a huge fan of this mod, but I was just wondering, are you working on getting the equip feature implemented in the 1.12.2 version of the mod—as well as the ability to rename backpacks by shift-clicking, both of which you used to be able to do? You can't use them in 1.12.2 because there's no a 1.12.2 version yet. Really busy with life. The mod is more "in-stasis" than dead, but either way it's not getting much love. I have ambitions to change this, but carving out the time to do so has been extremely challenging. If I can't do so in a few months I'm going to actively start looking for a maintainer/someone else to take it over. Hey, I'm giving you a heads up, I hope my Modpack will take off because me and my team are putting a lot of work in to it, you can see what it's about at: http://www.ataleaboutnature.weebly.com , thanks for the awesome mod! Neat mod in the old days but sadly this was added none stop in modpacks especially early as they had assumed it would come back with all the useful features we had. It's really no diff then any other bag mod sadly. I hope someone takes this over for 1.14. Try it again and let me know if it works. The link seems functional to me. Quick question: why is the 1.7.10 version off this mod no longer supported? Because 1.7.10 is 4.5 years old. Okay... I just waned to know the reason why that happened since many other mods seem to still support that version.